Do you have a Trader Joe’s in your area? If you do I’m going to guess that you have heard of the deliciousness that is their cookie butter. It’s amazing all by itself, but there are many things you can do with it besides eat it off the spoon! I use it for snacks, in baking, and to change up the traditional PB and J sandwich. 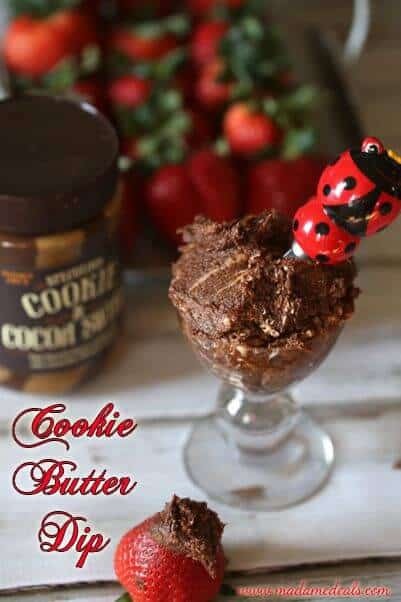 Are you looking for new Ways to Eat Cookie Butter? Today I’m sharing with you one of my most delicious recipe. This Cookie Butter Cream Cheese Dip Recipe is so delicious and you only needs 3 ingredients! You can use this as dip for fruits or even as spread. It’s a family favorite and is great for parties or gatherings! In your mixing bowl add together your ingredients and mix well to combine. I find it easiest to use a stand mixer or hand mixer rather than by hand but it is doable! Once your ingredients are mixed, let your dip chill in the fridge for about an hour. Serve and enjoy! How easy is that right? I love recipes that are easy to make and don’t take a lot of time because as a busy mom, I have stuff to do! And this recipe makes a perfect after school snack with some fresh strawberries and bananas. The kids don’t even complain about homework if they have this yummy dip to help them through it. Ha! Make your Cookie Butter Cream Cheese Dip Recipe now!